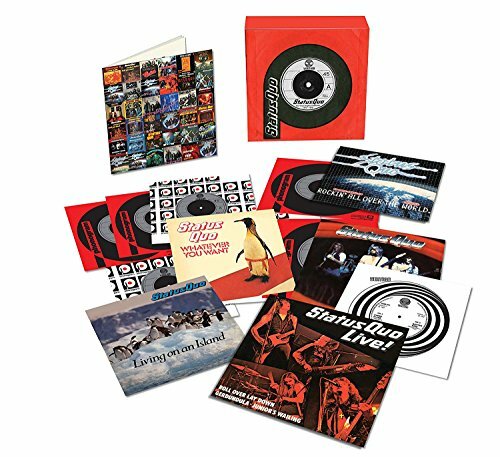 Universal are to release a series of five Status Quo seven-inch single box sets, the first of which – The Vinyl Singles Collection 1972-1979 – is due next month. With one box due for each decade (except the 1980s which needs two boxes!) these sets present the singles, mastered from the original tapes, and presented in their original sleeves (some picture sleeves, some generic label sleeves). 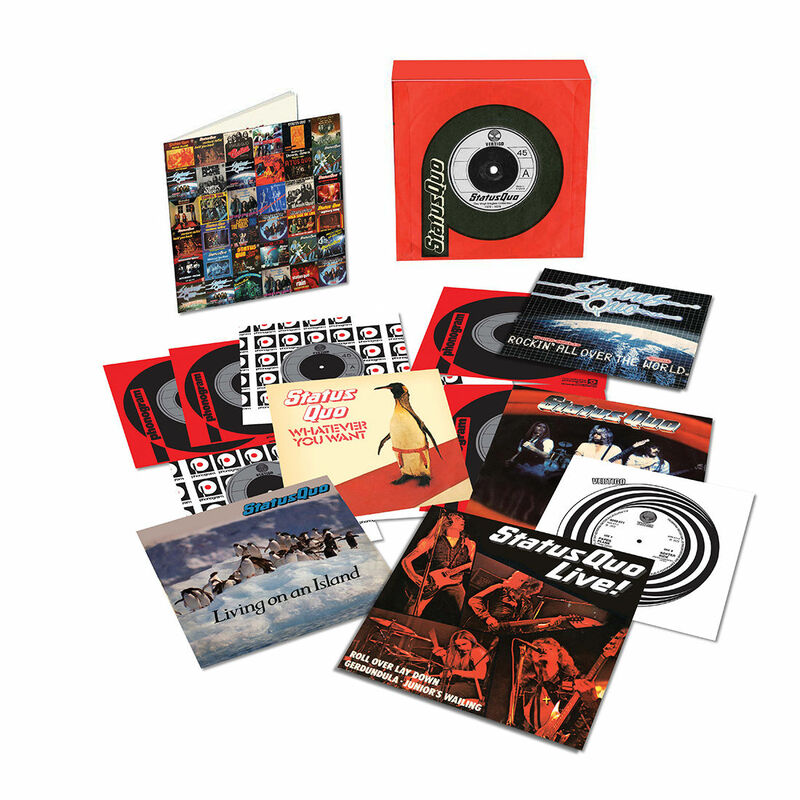 Each box comes with a booklet that features relevant information on each 45 along with images or rare foreign covers and memorabilia. The whole series starts with the singles taken from the first album with Vertigo (A&M in the US) which was Piledriver. Therefore, The Vinyl Singles Collection 1972-1979, kicks off with Paper Plane and ends with Living On An Island which was originally released in November 1979. It contains 13 seven-inch singles in total. The Vinyl Singles Collection 1972-1979 will be issued on 10 March 2017. I think it is a real pity with these box sets that foreign picture sleeves are not used where the UK release had a generic company sleeve. The Who (or rather their label) have also been ‘guilty’ of this recently. I also agree that there should be a parallel cd single replica release to please everyone. Rockin’ All Over The World was originally issued with a picture sleeve in a limited edition run of 10,000 copies with a poster. No mention of that being included. I think this is way over priced as all of these singles can be sourced very cheaply (apart from the poster edition of RAOTW). It would be far better if Universal released some soundboard quality live recordings from the 70’s. But seeing as they were quite happy to issue bootleg recordings that had been readily available on the internet on the deluxe reissues I won’t be holding my breath. These were my first ever music purchases, the “Roll Over Lay Down” and “Down Down” singles. The Roll Over Lay Down cover was the exact same. I still have it. May be for nostalgia reasons I’ll buy this box but I prefer CD’s. May be wait till the price comes down and then buy it. Of course already have all of this on CD-album. Sweet memories. I suspect you could buy the original singles for a lot less than buying this box set. Probably about 2 quid each! So these tracks are remastered, presumably digitally in 96/24 for permanent archiving, and the product released are 7″ vinyl boxed sets. No companion CD boxed sets. For the big-time Status Quo fan only, I presume. I am not a big fan, but this does scream of milking, playing on the current nostalgia for vinyl, while keeping the hi-res digital out of the marketplace. The lack of any digital companion, let alone hi-res, is disappointing. I am beginning to wonder if physical hi-res digital on blu-ray will go the way of SACD and DVD-A, and that CD will follow. I know I need to remember that the music industry is composed of competing businesses, trying to make money in a rapidly changing marketplace. What some fans want may not be commercially viable and what they do put out is what they think is. I know I am spending more money than ever before on physical digital music and failing to keep up with my desires but I at least would like the option of buying a reissue or boxed set in the format I want even if has to be combined with vinyl (e.g. Fleetwood Mac). If labels are keeping their hi-res back for later release, I hope they don’t wait until the market evaporates and I and most potential buyers of material from the 70s-90s are gone from this world. I heard that there will be a double CD (see Freddie Mercury’s “Messenger of the Gods” for a previous example of that) and most of these tracks are also included on the deluxe editions of the albums – though I don’t think any are available as hi-res. Obviously totally irrelevant to Quo fans, but I’ve always thought ugly Phonogram’s switch to centre labels seemingly heat pressed directly onto the vinyl, rather than a proper printed label…and particularly with Vertigo and its art design history. Oh can I just mention that there is a wonderful essay from John Peel on the Status Quo Live EP. A welcome collection but It will have to come down in price quite a bit before I buy it; having shelled out just £75 (a snip!) for the first Quo vinyl album box set last year (thanx of course to a SDE price drop alert), this is way toooooo expensive at the moment. I would buy this instantly if it was on cd-singles. Will that be coming out too or no chance? I am 100% positive there is no chance. Great shout for Ring of a Change – brilliant tune – would have been awesome live. They seem to have a thing for penguins? Yes, this was the ‘symbol’ for the “Whatever You Want” era. The album cover shows a penguin (on the back of the LP) being photographed and stared at by people with penguin badges (on the front cover) and the “Living on an Island” video was intercut with penguin scenes. I think it was intended as a metaphor for the whole stardom thing but not entirely sure. Jesus the money, for a few singles. Jeez!! Whats frightening is that from Down Down onwards I bought these when they were first released ! Dont remember ever having a picture cover until Rocking All Over the world came out . Ring of a Change has to be one of the BEST B Sides by anyone in the History of B Sides not just in the awesome History that is the Singles Discography of Status Quo. I know it is also an album track albeit a longer version of the B Side with extra lyrics but it is just an Awesome tune – could easily have been a single! About time Apple did this for the Beatles…and for their EPs too, although the price of this Quo set seems rather steep at present. They did. Way back in 1976! Check out Beatlesales.com if you want to pick up a collection. And there was a further collection of either picture discs or CD singles in the early 90’s if I remember correctly. @Steve Beauchampe It has been done for the Beatles. There was an EP box in ’81, a 7″ box in ’82 and both reissued as CD boxes in ’92. Admittedly, it was a while ago! Reissues might be in order. My point exactly, 25-35 years ago (I was aware of these), and available as I recall in some rather clunky packaging (a wooden box perhaps). They would surely make a much smarter job of it today, include a great booklet, vinyl and cd versions…the re-issued Long Tall Sally EP and Record Store Day red box of four singles from a couple of years ago showed how to do it if I remember correctly. Yes, a nice re-issue with the new masters and the ‘Anthology’ singles included would be nice. It would also be nice [well, I’d like one] a Bob Dylan set like this, especially as those singles are not so easy to come by [by dint of the fact that he didn’t sell many copies of them]. In addendum, if we’re going to start a “best B-side” thread, I’ll put forward Bob’s ‘Trouble In Mind’ [take ‘Man Gave Names…’ off of ‘Slow Train Coming’, stick ‘TIM’ as the opening track and you may well have the greatest Blues Protest Album of all time]. I’m wondering if the 90s/00s sets will include all tracks from CD singles…or just the 7″ b-side..